Here's a great Vegetarian Paella that shows you can enjoy real traditional and authentic Spanish dishes without eating any meat or poultry. There is little bit of work involved is in the preperation - after that it's a dawdle. Delicious fresh vegetables deliver an easy healthy and satisfying meal with all the tastes and aromas of the Mediterranean. 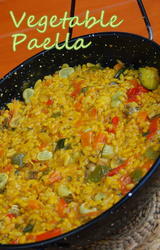 And there's more - check out our Seafood Paella Recipe and our Chicken and Chorizo Paella if meat and fish are your thing. Now in a 13" Paella Pan - on a high heat - fry the onions mushrooms, red pepper, carrot and courgette/zucchini - stirring frequently for about five minutes, you want them to color but not burn. Reduce the heat to low and add the garlic stirring for two minutes. Add the tomatoes and stir for a further two minutes. Then the rice - which you stir for a couple of minutes until it begins to turn opaque. Remove from the heat and boil up the stock with the Saffron for about ten minutes. 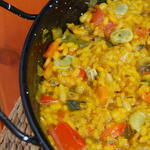 Now - replace the Paella Pan on a high heat - add the peas and beans half of the stock and give a final stir. Let the liquid reduce (don't stir it again) and add the rest of the stock. Cook until the rice has absorbed 90% of the liquid and then remove from the heat. Cover the Pan with a clean cloth and leave for ten minutes or so, until the rice has absorbed all the liquid. Now - chop some parsley and sprinkle liberally on top of your Paella. Serve with the lemon quarters.